Walk from our 7500 square foot oceanfront estate down 5 steps onto the beach. Sip wine in our oceanfront hot tub as you watch the spectacular sunsets. Enjoy a meal catered by the best chefs from nearby restaurants using locally sourced organic produce, meat and fish. Take a wine tasting tour of the Guadalupe Valley with Ray in his luxury van https://bajawineanddinetours.com or go horseback riding with Pretty Horse in the hills overlooking the ocean. You can take our kayak out to the kelp beds to fish, you can play tennis on the community tennis courts or you can walk around our development and enjoy the smells and sights of ocean front living as Pelicans dive for their dinner. Our house is the largest estate available for rental on the Baja coast, we are located 10 minutes south of Rosarito next to Puerto Nuevo and near excellent restaurants (La Fonda, Splash, Charlie's). We comfortably sleep up to 18 people and we are the ideal destination for birthday’s, celebrations, wedding anniversaries and family reunions. We have renters that are groups of friends coming to Baja to relax or do a little surfing. we have renters celebrating a birthday or a wedding anniversary (including 50th wedding anniversary celebrations) at our home. We have children renting for their mom and dad and we have parents renting and bringing all the children and grandchildren together for a special vacation. Our home caters to everyone and has something for everyone. We have a huge side yard for playing soccer or sunbathing with an above ground pool that the kids (small and big) love. There is an enormous front yard with hammocks where you can nap, watch the dolphins and then nap a little more. The house is located in the gated upscale community of Mision Viejo with security guards patrolling at all times. It is conveniently located 2 miles south of Puerto Nuevo and 2-3 miles north of Splash and La Fonda, you are centrally located for fishing, golfing, Guadalupe Valley wine tours, the Ensenada fish market and sport fishing charters. Our guards will call a cab to take you to the clubs in Rosarito and then bring you home. Our inner courtyard has both gas and mesquite grills and an enormous fireplace. We have another enormous fireplace in the great room and a fire-pit directly overlooking the ocean which is the perfect place for roasting marshmallows. We have 4 casitas with queen beds in each, a master bedroom with a king bed and a 1500 square foot 2nd floor loft with a king bed, a futon and a sleeper sofa. We also have a TV lounge with a sleeper sofa. Our home is the northernmost Oceanfront house in this gated community, you step from the lawn onto the beach and our beach is secluded and completely private. We built this house ourselves and we furnish it to ensure high quality and comfort because we stay here also. The house has a state of the art kitchen and a huge dining and living room. We have a large roof deck to sit on and watch the dolphins and a private master bedroom verandah. You can walk through our seawall gate onto the beach and into the waves. You can take out a board and go surfing in the great breaks in front of our houses that are only available to renters. Go out in our kayak to the kelp beds and catch fish or stand on the beach and surf fish and then grill your catch outside on the BBQ or in our lovely kitchen. When its cool you can sit in front of a roaring fireplace in our great room or play games, read a book or catch up on Netflix in our lounge. You can sit on the Master bedroom balcony or front patio and read as you watch the pelicans dive for their dinner and the dolphins romp with the surfers. You can walk across our indoor bridge to the roof deck and sit and enjoy an exquisite sunset, after which you can let the ocean send you dreams as you fall asleep to the sound of the surf. This estate is luxurious and caters to the higher end rental market. If you want a very unique property and the vacation of your dreams in an 'Architectural Digest' home, then this is the house for you. The granite kitchen features state of the art appliances and is a chef's dream. There is a dining room and a wonderful bookcase lined family room with satellite HD TV. We have Wireless Internet throughout the house. The courtyard has a built in gas and charcoal BBQ and we have a large private side yard for sunbathing. The side and front lawns are lovely for sitting on or tossing a ball around. The fire pit in front of the ocean means you can roast marshmallows and watch the waves in the evening. This is truly a one of a kind rental. There are many activities available. Horseback riding through the canyons and hills of Baja or you can walk up the beach to the Sand Dunes, and drive 5 minutes to La Fonda for their world famous Sunday Brunch or to Puerto Nuevo for a lobster dinner. We are central to Rosarito and Ensenada and surrounded by wonderful restaurants. We are a short drive from the Guadalupe valley and can connect you with Baja Luxury Wine Tours. The Guadalupe is wonderful and you can spend the day wine tasting or go on tours of some of their lovely vineyards. This EXCLUSIVE PRIVATE OCEANFRONT ESTATE OFFERS SEA, SURF, SAFETY & SECURITY. Enclosed within its’ own PRIVACY WALL. It is located in the most secure UNIFORM GUARDED, GATED COMMUNITY in northern Baja. Our oceanfront home offers you the ULTIMATE in SECURITY, PRIVACY and BEAUTY. Here is a sample of what our renter's say. We had the BEST time in your home. We loved every minute of it and it was very relaxing for everyone. Very rarely do things exceed your expectations, but this really did for us. Our group is thoroughly enjoying the house and we are so sad to leave. Is it available for additional nights? My husband spent every day in your kayak and brought back fish for dinner every night, while I sunbathed. We will be back next year and every year, please put us down for next summer. We love Baja and being able to own an oceanfront home was our life long dream. 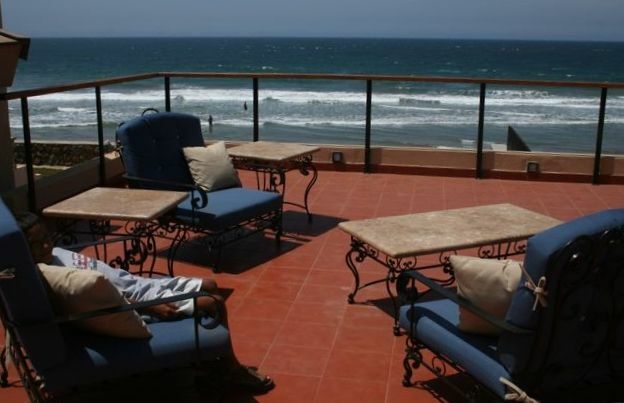 This complex is secure and close to wonderful restaurants and Rosarito. You can go to this property and just enjoy a week or two of completely relaxation and not have to worry about doing anything. We have a maid that will come in daily if you wish and we also have someone that will cook your meals for you and we have wonderful restaurants nearby. There are plenty of actives you can choose, you can go our to the kelp beds and catch your own dinner, take a wonderful tour of the Guadalupe vineyards, horseback ride, deep sea fish in Ensenada or spend the day sunbathing or swimming. Don't forget a glass of wine in the jacuzzi as you watch the sunset. This is an amazing place to take your family. Roof top deck, Master Bedroom Verandahs, covered courtyard. Great house, well equipped. Plenty of room for lots of people. We had a perfect weekend! This house is great for large groups. Lizzie is quick to respond and very accommodating... Thank you so much Lizzie for a great stay! Love this place! Very friendly owner! I have now stayed at Lizzy’s place twice. Both times we have had a large group and this house does not disappoint. Lizzy has always been extremely kind, accommodating, and quick to communicate. That makes this place a must for a decent sized group. She has a friend in the same neighborhood named Ray who runs Baja Wine and Food Tours. He is also very kind and accommodating. To be honest, I wish I could go stay there once a month. Beautiful place with very kind people! It’s a must! This truly is a magical place! The picture don't do it justice - it's huuuuge. We had 18 people sleeping there and everyone was comfortable, I also led a few events where up to 30 people were over for a meal and yoga and it worked perfectly. Tons of room - both big spaces for groups and smaller more private spaces. The backyard is incredible! Overall, we just really really loved it and hope to come back soon :) Highly recommend renting this! Our stay was absolutely amazing! Once we got there I understand why Lizzy kept referring to the place as a “compound.” It easily fit our group of 17, the house was laid out perfectly to give everyone room. Our favorite parts were the secluded vibe, location right on the beach, and the many fire pit hang out spots. Our experience was simply better than we could have imagined. Great house for a large group. Comfortable space and well furnished. We had a group of 19 at this house for the weekend and it was very comfortable. Baja Luxury Wine Tours is located in our sub-division and will take you on a chauffeured tour of the Guadalupe Valley. Puerto Nuevo is two miles north and La Fonda and Splash 2-3 miles south with wonderful food and Sunday Brunch. Kayaking and Surf Fishing are available in front of the house. Whale Watching and Sports fishing charters is available in Ensenada. Catering, Concierge services and in-home spa services are available for your vacation for an additional fee.